Most traders analyse price action by either using bars and Japanese candlesticks whereas some also use heiken ashi candles and range bars for instance. This article reviews a type of chart that seems to catch less attention from the majority of traders, which is the line chart. We will analyse whether line charts offer value and how traders can use these charts for trading decisions. Who Uses Line Charts Nowadays? Line charts are often used on TV where the price of the instrument is visualized by a single line. The line chart only shows the close and the relationship of the closes versus each other, which means that the line either moves up or down. Despite the popularity on TV, this type of chart always seemed (too) simple to me. There is much more information available when viewing price movements with other charts, such as the bars, Japanese candlesticks, heiken ashi candles, and range bars. In my opinion, most traders avoid using line charts because they lack lots of the information that, for instance, candlesticks do offer: open, high and low. This data allows traders to gauge and understand the sentiment with more context. It allows traders to understand the market sentiment during the candle and how patterns between candles playout. All in all, most traders do not actually use the charts that seem to be so popular on TV. They prefer more data and information. With that said, I do think that line charts offer traders an interesting, refreshing, and simple way of analysing the charts. About a year or two ago, I started to use line charts for the first time. I still use them now but only occasionally and as an extra added analysis. My main analysis is still done with Japanese candlesticks charts. But line charts did offer enough value for me to add them to my bag of analysis, just like many of the tools and indicators from the Supreme Edition from Admiral Markets, such as the Pivot Point indicator, Keltner channel, and many more. What are the main benefits of line charts? In my view, it’s the simplicity of line charts that really offers traders a plus. The price movement is clearly visible and hence momentum and correction can be spotted much quicker and with less effort. Spotting momentum and correction is a key part of understanding the chart in a deeper way. Line charts make it simple to see these patterns. Another benefit of using line charts is that traders can connect the closes for drawing support and resistance trend lines. Traders can measure and trade breakouts once price breaks a trend line by closing above or below it. The line charts simplify the process of understanding momentum and correction. In the GBP/CAD image you can see an example where price is showing strong bullish momentum, which is then followed by a slow bearish correction. With line charts, it’s even easier to spot the flow of the market and understand what is the ‘path of least’ resistance. In the GBP/CAD example, the flow was one more upside after the break above the corrective channel. The break above the channel in fact was also visible when the candle close closed above the resistance trend line of the bearish channel. You can switch back to candlestick charts in case you want to see the break from a candlestick perspective. 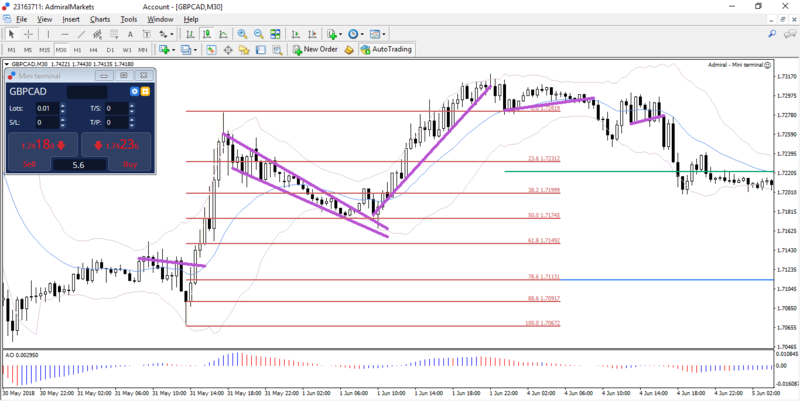 The GBP/CAD made a breakout and one more retracement before moving up higher. A very tight 13-15 pip stop loss below the nearest bottom would have created a loss… But a wider stop loss below the 61.8% Fib would have survived and turned for a win. Of course, make sure to use these ideas only on financial instruments you have done your own proper analysis first. This is in a way a supportive method of analysing the charts. Always test these ideas first on a demo account of course before applying them on a real account. Wishing you a happy week of trading. 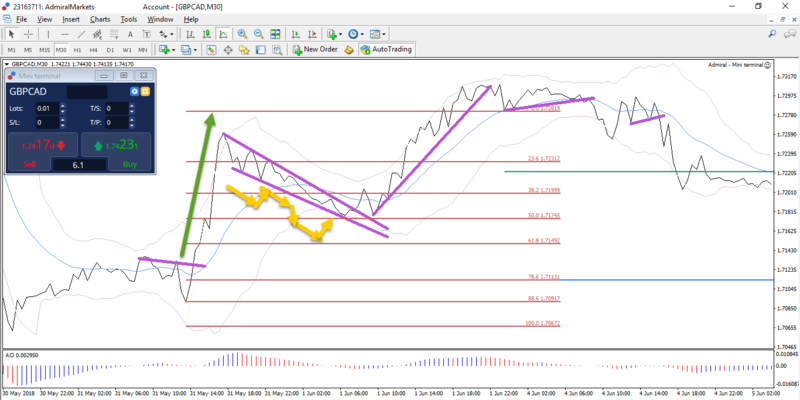 Source: Do Line Charts Offer Value to Forex and CFD Traders?